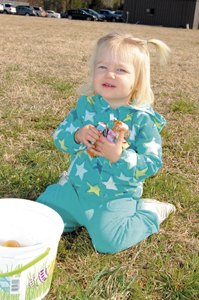 Showing 56 articles from April 3, 2013. FRANKLIN COUNTY — One of the goals of mental health reform was to make sure that the people who needed the help wound up in hospitals, not in jails. Ultimately, those folks may get admitted to a mental health facility, but until they do, they are the responsibility of officers. LOUISBURG — The county’s Board of Adjustment shot down an appeal that would have let Youngsville businessmen operate a commercial gun range just outside Louisburg. Eric Coombs and Aaron Byrd said they haven’t fired all their bullets, though. 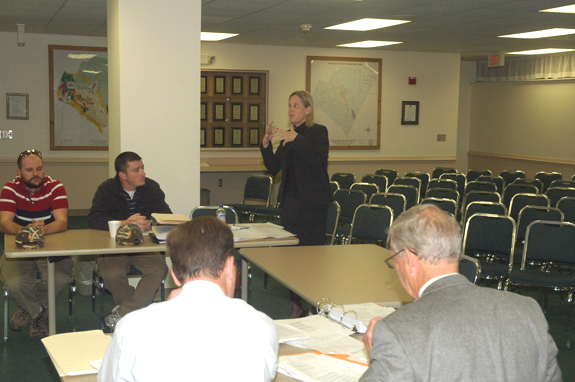 Coombs and Byrd applied in December for a special use permit to operate a gun range on a 171-acre site on Dunn Road. 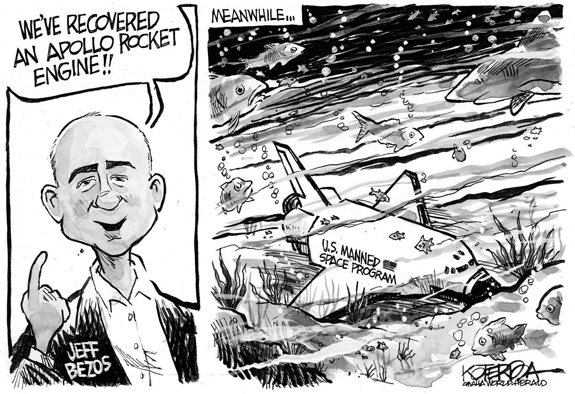 TRANSPORTATION PLANNING. Scott Lane (left) of Stantec Consulting of Raleigh listens as Al Fuerst of the Spencer’s Gate Community (center) and Bunn Police Chief Kent Winstead discuss ways transportation can be improved in Franklin County. 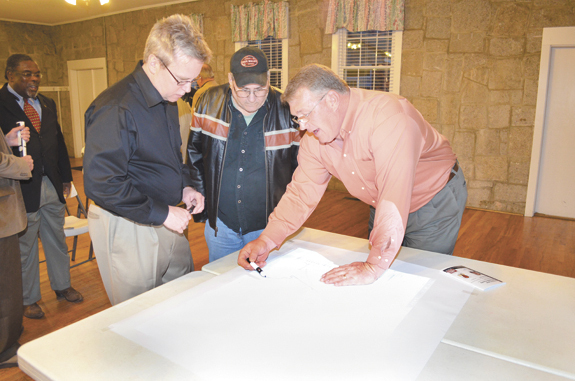 The 25 or so who attended a Northeast Area Study traveling “roadshow” Tuesday evening in Youngsville were treated to a “menu” of planning options that span the next 40 years. The planning meeting was hosted by the Capital Area Metropolitan Planning Organization (CAMPO) and Stantec Consulting, the Raleigh company hired to actually do the study. 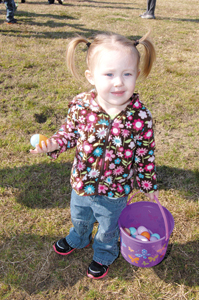 Ever wonder what an Easter egg hunt looks like from the perspective of an Easter egg? 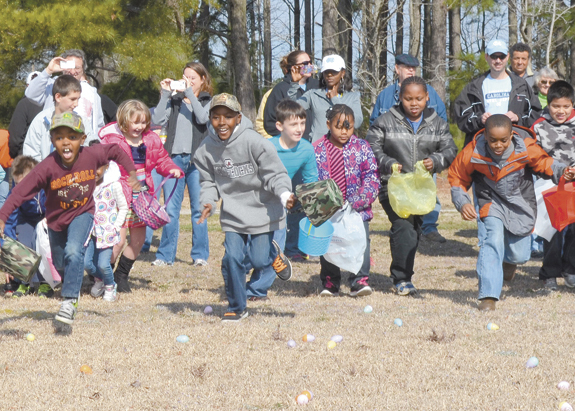 This photo pretty much sums it up — and for other views of the annual Bunn Easter Egg Hunt, see 'Community' section of this edition. LOUISBURG ­— An innovative plan to give high school students a jump on college has ended up taking a bigger leap than expected. 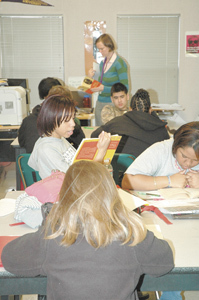 As its designed, Early College High School students can earn their diploma and two years of college study as part of a five-year plan. A Louisburg man was killed on Saturday when he ran off the road and hit a tree outside of Nashville. According to the State Highway Patrol, 33-year-old Marcus Bradley was driving south on Highway 58, three miles north of Nashville, when he ran off the road to the right, then overcorrected and crossed the center line, then ran off the road to the left and collided with a bale of hay. GOOD MORNING: Back in the saddle again. Although I can’t recall exactly what year it was that The Franklin Times began publishing twice a week, I was there at the time. Just prior to that time we were located across the street from the Franklin County Courthouse at 215 Court Street, just around the corner from the Louisburg Fire House and Police Station at Market Street and Bull-Run Alley (now Johnson Street), which made it easy to keep in touch with what was going on. With all the debate going on regarding marriage, the defense of marriage and the definition of marriage, it was nice to come across one potential piece of legislation on the matter that could bring about a chuckle. Don’t get me wrong, marriage is serious business. This column was being pecked out Tuesday, not long before I was planning to head down to Youngsville for what will probably be the most infuriating, frustrating and pointless meeting of 2013. 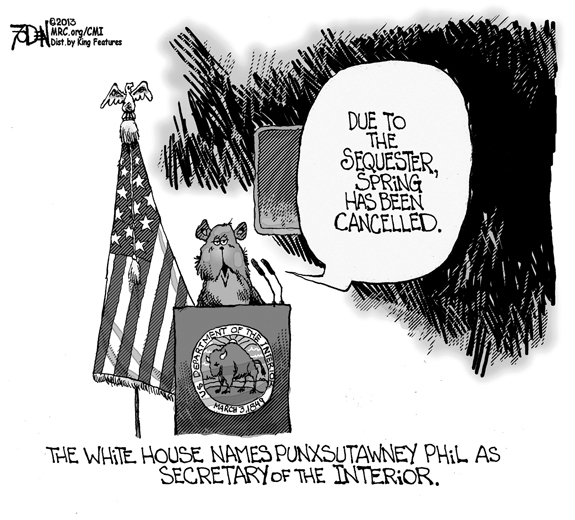 And for someone who spends a lot of his life attending just such meetings, to describe it as the worst of the year is quite a prediction, especially since it’s only early April. A lot of Franklin Countians nearly had a collective stroke recently when the worlds “electronic election equipment” began to be bandied about. Those words dredge up the frightening prospects of electronic voting machines — especially voting machines which do not provide a reliable backup and verification system on good old paper! Hi! My name is Abigail J. I am a fifth grade student at Harlan Intermediate School in Harlan, IA. My class is studying the history and geography of the United States. I am excited to study North Carolina; it looks like a beautiful and fun state. YOUNGSVILLE - Darrell S. Roettger, 60, died Monday, April 1, 2013. City of Oaks, Raleigh. YOUNGSVILLE —Edward C. Merritt, 70, died Thursday, March 28, 2013. Arrangements by Bright Funeral Home, Wake Forest. WILTON - GRANVILLE COUNTY—Harold Winston Gooch, 80, of Franklinton passed away Tuesday, April 2, 2013 at his home. He was born in Granville County on November 1, 1932, the son of the late Edgar Newton Gooch and Lorine Henley Gooch. He graduated from Wilton High School in 1951, where he played baseball. He was a member of Mt. Carmel Christian Church where he served as deacon for many years. LOUISBURG - Margaret Gardner Holland Harvell, 94, died Sunday, March 31, 2013. LOUISBURG - Mary Louise Hill, 102, died Tuesday, April 2, 2013 at Louisburg Nursing Center. 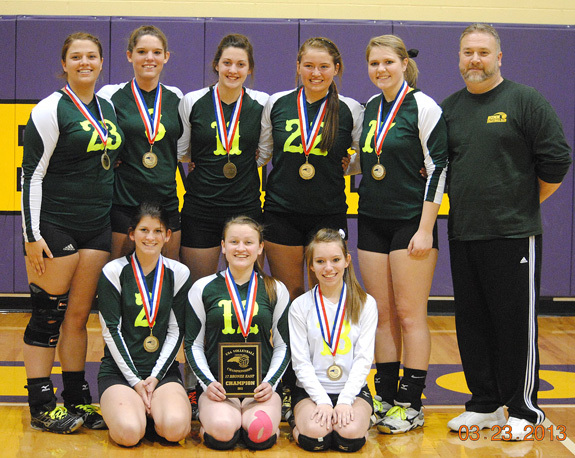 Funeral services will be held at 1 p.m. Saturday, April 6, at St. Matthias Episcopal Church, Louisburg. Burial will follow in the Cemetery on the Hill, Louisburg. ROCKY MOUNT - Funeral services for Phillip John “Big Red” Lynch, 39, who died Sunday, March 31, 2013, will be held at 2:30 p.m. Sunday, April 7, at Pleasant Grove Baptist Church, with the Rev. Linda Taybron officiating. Burial will follow in the church cemetery. RALEIGH - Roy Hines Alford, 94, died Wednesday, March 27, 2013 at his home. A funeral service was held Tuesday, April 2, at Highland United Methodist Church in Raleigh, where he was a founding member. Interment followed at Raleigh Memorial Park. RALEIGH - Samuel Furman Tart, 53, died Monday, April 1, 2013. Funeral services will be held at 2 p.m. today (Thursday, April 4) at Lancaster Funeral and Cremation Services Chapel, with the Rev. Robert Collier officiating. 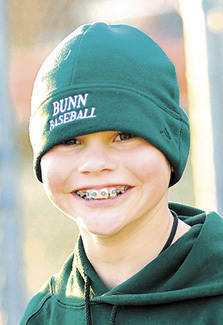 Interment will follow in Pine Forest Cemetery in Wake Forest. MANSFIELD MAKES IT FOR LC. 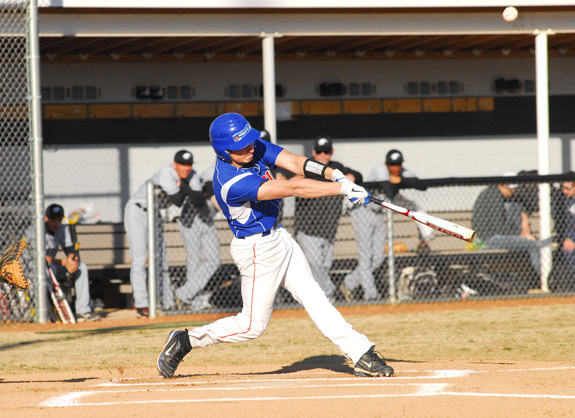 Louisburg College freshman Tim Mansfield slides safely into home plate off a wild pitch during last Saturday afternoon’s doubleheader split at Region X diamond rival Guilford Tech Community College. 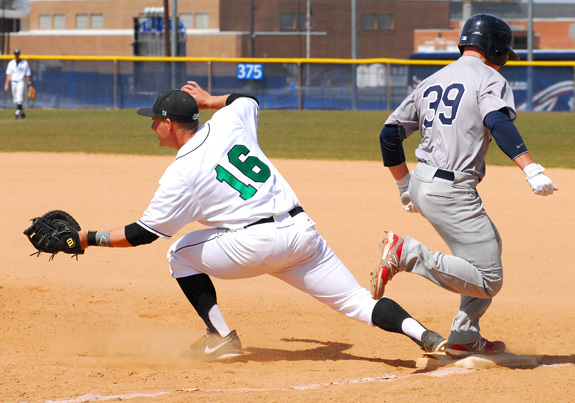 JAMESTOWN -- Through the midpoint of the Region X baseball schedule, this much is evident -- it’s anybody’s ballgame. The top-portion clubs in the league have taken turns beating each other, with no squad standing out to date in the parity-filled conference. SOLID CONTACT. 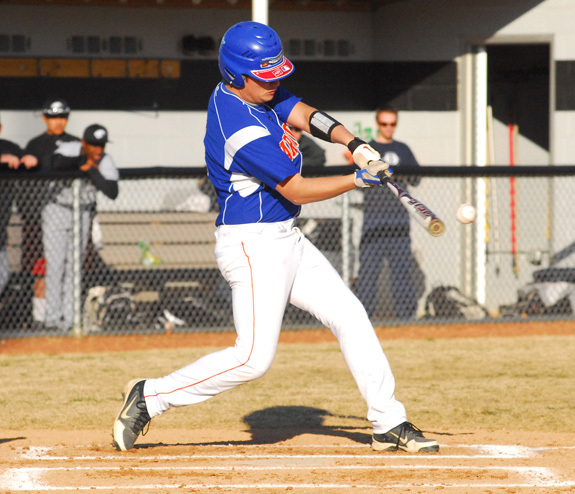 Louisburg’s Jacob Wood rips a base hit for the Warriors during Tuesday evening’s non-conference road game against Granville Central. LHS went 1-1 as part of a successful baseball week. STEM -- While some of their schoolmates were enjoying Spring Break at the beach, members of the Louisburg High School baseball squad were taking a little road trip of their own. Due to poor weather over just about the entire spring, the Warriors were in need for some make-up dates for postponed contests. WAITING FOR YOU. 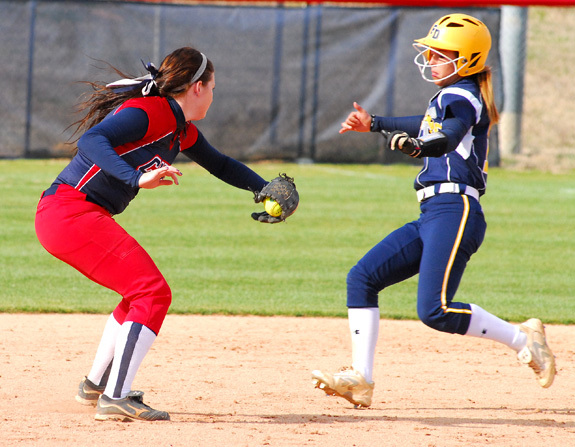 Louisburg College’s Morgan Tharrington (left) prepares to make a tag during last Thursday’s twinbill against Florence-Darlington Tech. LOUISBURG -- The same old song-and-dance routine continues to hinder the Louisburg College women’s softball program. Excuse LC head coach Don Stopa if he has heard these lyrics before. Louisburg’s prolific offense is destined to keep the Lady Hurricanes in games -- even against some of the highest-level opponents in Region X action. LHS’ DEFENSIVE MASTERY. Louisburg High School’s Samantha Calvery has been strong in front of her keeper this season. 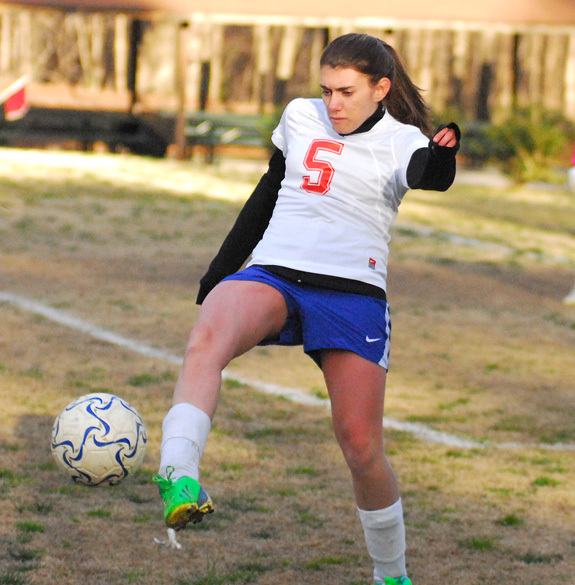 Calvery has signed a letter-of-intent to continue her soccer career at Louisburg College. LOUISBURG -- One of Coach Andy Stokes’ most pertinent off-season recruiting priorities was to bring more local players into his Louisburg College women’s soccer program. Stokes definitely achieved that goal with each of his first two official signees -- as both performers hail from just up North Main Street at Louisburg High School. Corinth Holders at Franklinton 6:30 p.m.
North Johnston at Bunn 6 p.m.
GREENVILLE -- Ryan Wilkins held East Carolina University hitless for five innings and Brett Williams drove in three as the No. 25 North Carolina State University baseball team dropped the homestanding Pirates 6-1 on Tuesday at Clark-LeClair Stadium. The Wolfpack (20-10) took control with three runs in the third and built a 5-0 lead with single-run innings in the seventh and eighth. WENDELL -- Franklinton High School dropped a pair of road matches last week in Northern Carolina Conference boys tennis action. The Red Rams fell to Corinth Holders (8-1) and North Johnston (6-3). CH is guided by former Louisburg hoops coach Chris Davis. BACK IN THE SWING OF THINGS. 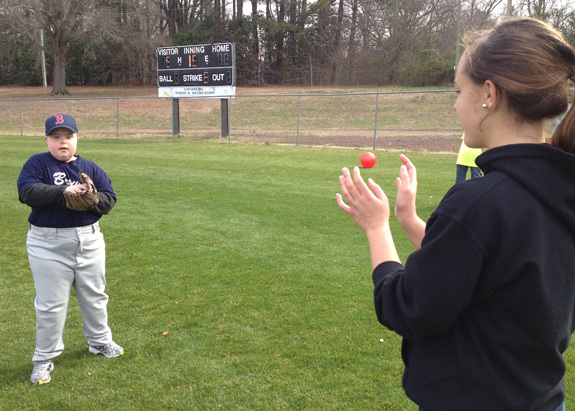 The Miracle League of Franklin County has kicked off its spring season with a recent Angels in the Outfield Clinic and Opening Day. 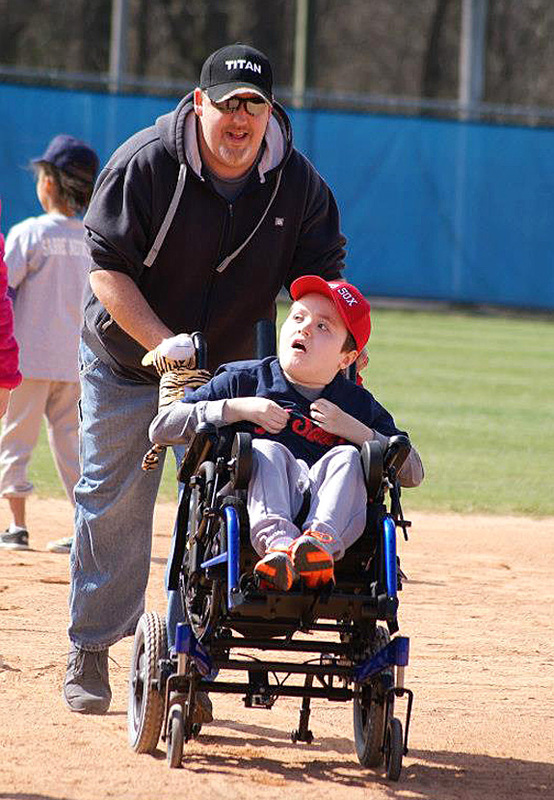 (Above), Branson Reavis gets some help around the bases from his uncle, Mike Strum. TROPHY TIME FOR THE ROYAL KNIGHTS. 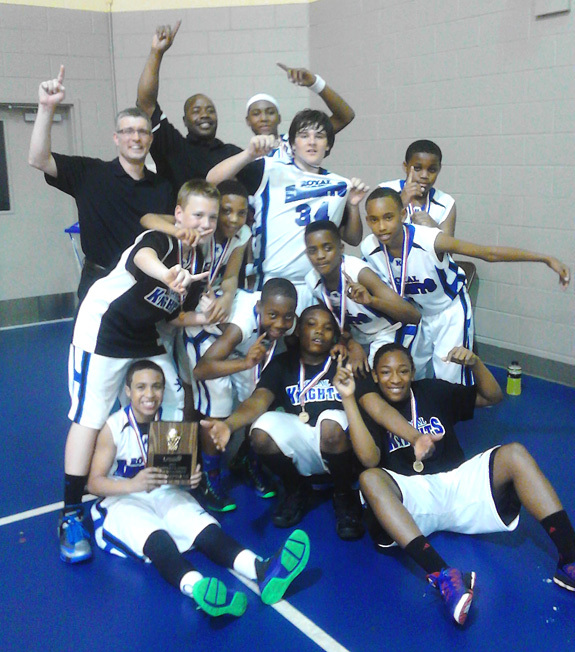 Members of the Franklin County Royal Knights Seventh-Grade Basketball Team celebrate after winning a tournament last weekend in North Myrtle Beach, S.C.
FRANKLINTON -- Success on the court and in the classroom are the two main priorities of the Royal Knights AAU Basketball Program, which is based out of Franklin County. Featuring players from Franklinton, Bunn, Youngsville and Louisburg, the Royal Knights currently field five boys teams and one girls squad featuring ages 8-17. ZEBULON -- Billed as the “must-see affiliate” in the Cleveland Indians Player Development System by Baseball Prospectus, the Carolina Mudcats feature two of the top five organizational prospects and five of the top 30. A total of 13 players return from last year’s team. First-year manager David Wallace will lead the squad. RALEIGH -- Jim Rutherford, President and General Manager of the National Hockey League’s Carolina Hurricanes, has announced that the team has acquired a conditional 2013 sixth or seventh round draft pick from the Pittsburgh Penguins in exchange for forward Jussi Jokinen. Carolina retains a portion of Jokinen’s salary. 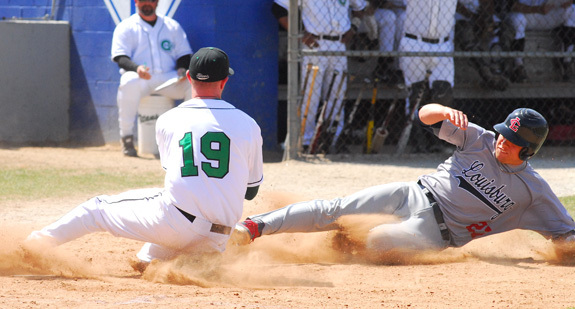 Louisburg College’s Chris Mansfield (right) slides safely into second base as the ball sails into the outfield during last Saturday’s Region X diamond doubleheader at Guilford Tech CC. Louisburg High School’s Caleb Allen sends a ball into the air during Tuesday evening’s non-conference baseball game on the road at Granville Central. 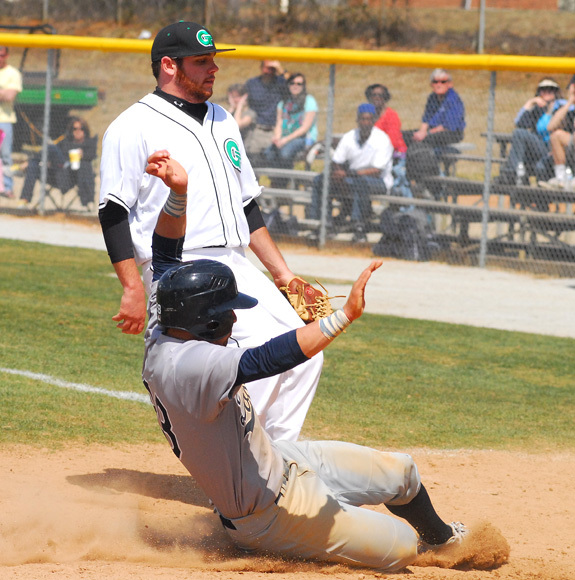 Louisburg College’s Pete Guy (right) is tagged out at home plate during last Saturday afternoon’s road doubleheader against the Guilford Tech Titans. 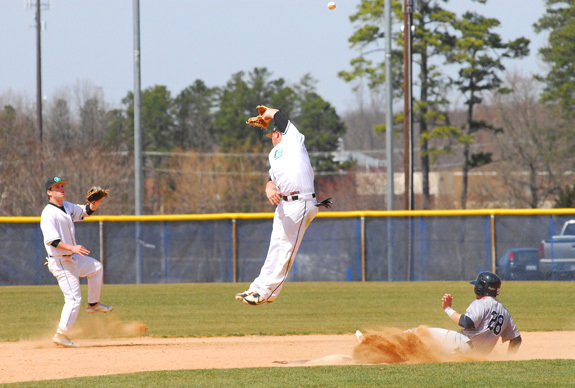 Louisburg College’s Chris Williams (right) is out by a hair at first base during last Saturday afternoon’s road doubleheader against Region X baseball rival Guilford Tech CC. 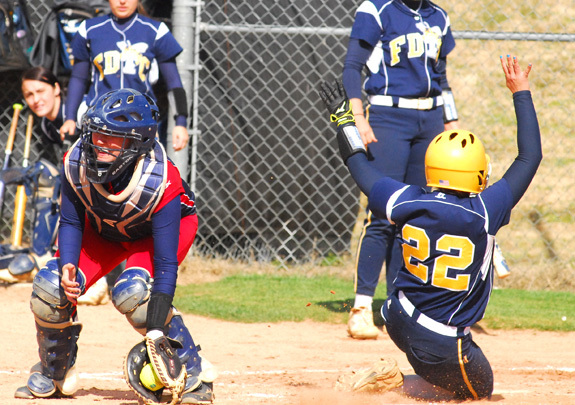 Florence-Darlington’s Mary Beth Deneke (right) slides into home plate as Louisburg College’s Sommer Di Fulgo fields a relay throw during last Thursday afternoon’s softball doubleheader. How do you solve a problem that seems to have no answer? 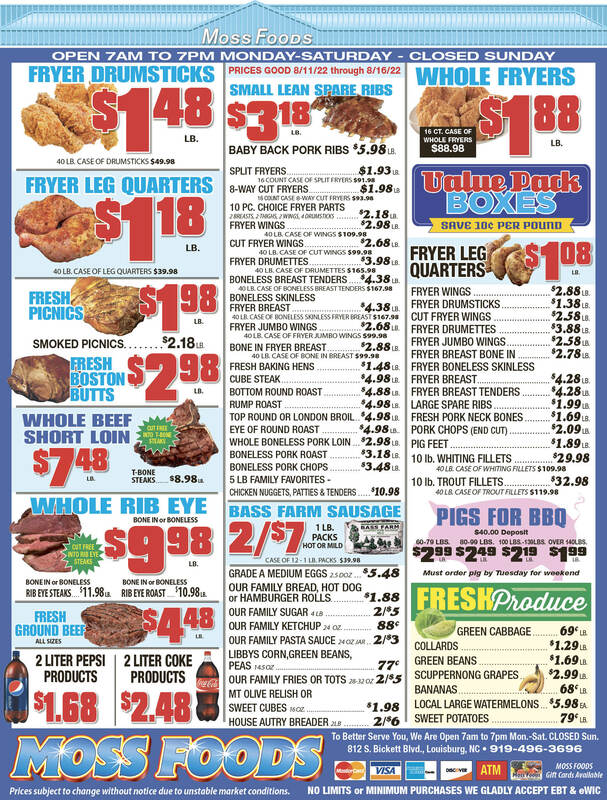 According to the experts, we make thousands of choices every day. We begin by deciding whether or not we will get up when the alarm rings, how long we will take to brush our teeth, what we will eat for breakfast, if we will clean up after breakfast, which route we will drive to work and so forth. There are so many choices it is surprising we sometimes find ourselves in a rut. APRIL WEDDING BELLS. Mr. and Mrs. Steven Haden of Bunn and Mrs. Eva Aycock of Louisburg announce the approaching marriage of their children, Teri Ellen Haden to Anthony Garrett Aycock, Saturday, April 27, at 2 p.m. at Sandy Creek Baptist Church, Highway 561, Louisburg. 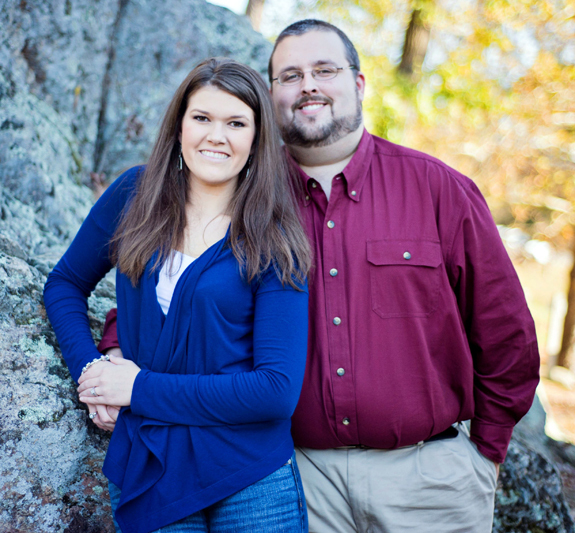 The bride-elect is also the daughter of the late Michael J. Aycock. 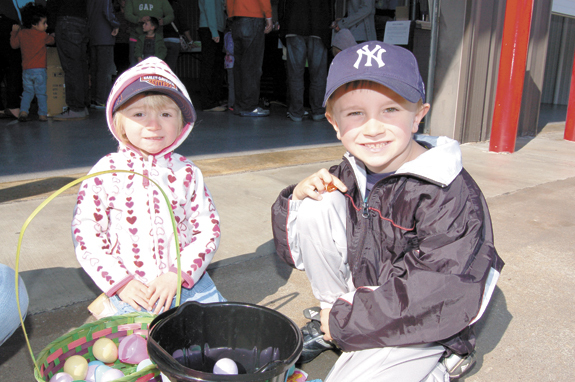 A reception will follow at the Forest Lakes Clubhouse. Invitations will be mailed. 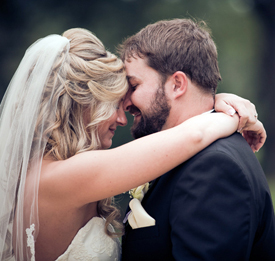 Rebecca Elizabeth Mainquist and Matthew James Gibbons were united in marriage on Oct. 6, 2012 at Blandfield Plantation in Caret, Va. The 4:30 p.m. ceremony was officiated by the Rev. Lewis Brandt. The bride is the daughter of Richard and Loretta Mainquist of Louisburg. The groom is the son of Kimberly Gibbons of Richmond, Va., and James Gibbons of Burke, Va.
A celebration with family and friends was held in honor of Louise E. Spivey Lee’s 100th birthday on March 30 at the Doubletree Hotel in Wilmington, Del. She was born March 30, 1913 in Franklin County to the late Charlie Sr. and Ellen Williams Spivey. She now resides in Wilmington, Del. As you drive around these days, you will notice more impervious areas: roads, buildings, and parking lots with less greenery or vegetated areas. Imperviousness is important because it can affect our drinking water supply as well as flooding during large rain storms. The following Franklin County students were named to the Honor Roll for the third-quarter grading period at Kerr-Vance Academy. LOUISBURG — Franklin County management advised commissioners that the issues clouding its emergency communications system may be lifting. The nearly $11 million system has experienced problems ever since law enforcement communications were switched over late in the fall. 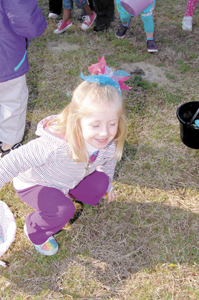 Hayden Parker, 3, of Bunn hunted eggs. Navy Petty Officer 2nd Class Brandon A. Adams, son of Doretta Adams of Youngsville and Felix Adams of Youngsville, along with other Sailors attached to the guided-missile destroyer USS Farragut (DDG 99), visited Bar, Montenegro. Franklin County farmer, Steve Mobley, has recently been elected president of the Durham Farmers Market. The popular spot, located in downtown Durham, has more than 65 vendors and more than $4 million annual sales. It is consistently ranked in the top ten farmers markets in the United States. Franklin County sheriff’s deputies arrested a trio of men accused of stealing an all-terrain vehicle. The investigation led to the arrest of a fourth man and drug charges. Tony Gaskins reported on March 12 that an Arctic Cat ATV was missing from Taylor Creek Farms near Franklinton.